Chris Patterson has been a private practice attorney since 1980. He has extensive experience in several areas of the law, but presently practices primarily in Divorce and Custody, Traffic/Driving While Intoxicated, Mediation, Criminal Law, Juvenile Law, and Wills and Trusts. Chris graduated from the University of Missouri-Columbia in 1976 with a Bachelor of Journalism degree. He received his law degree from the University of Missouri-Columbia School of Law in 1980. Since then, he has practiced primarily in the Platte, Clay and Jackson County courts, where he is a well-respected member of the legal community. He is regularly appointed by judges as a Guardian ad Litem, representing the interests of children. In 1998, and again in 2010, he was one of three attorneys submitted to the Governor of Missouri for consideration for a judicial appointment in Platte County. Chris values his reputation as an honest, hard working, reasonable and effective attorney. Volunteer interests have kept Chris connected with the pulse of the community. He has been an active Young Life leader and trainer since 1982 and received the Young Life National Volunteer Leader Award of Excellence in 2012. Young Life is an ecumenical Christian organization whose primary focus is youth. Chris works with high school students, as well as the training of leaders and staff, both locally and nationally. He has authored a book, "The Adventure," which is published by Young Life. Chris is an active member of 12 Apostles Catholic Parish in Platte City, Missouri. Chris has received the Excellence in Education Award from the KCI/Northland Regional Chamber of Commerce for his service to education. 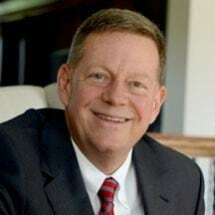 He is also a member of the Platte County R-III High School Pirate Hall of Fame and a member of the Board of Directors of the Platte County Education Foundation. Chris has been considered for multiple judicial panels and has argued and won a Mechanic's Lien case before the Missouri Supreme Court - Commercial Openings, Inc. v. Mathews, 819 S.W.2d 347 (Mo. banc 1991).